2.00 pm to 4.30 pm (except on 5 May, 12 noon to 4.30pm). A 5-week step by step exploration of the Christian faith in a relaxed, non-threatening, thought-provoking and friendly environment. A weekly open discussion after watching an introductory video. Time of interaction over a sumptuous tea break. Non-churchgoers (please invite your friends and family members who are pre-believers to attend). Young believers and churchgoers who feel that they have not received the fundamentals of the Christian faith, or who wish to re-dedicate themselves to the Christian faith. Small groups of 8 to 12 people, hosted by one or two leaders who facilitate and encourage discussion where everyone is welcome to contribute their opinion, ask questions and discuss with the rest of the group. 7 Apr Alpha Introductory Session 1: Is there more to Life than this? / Why read the Bible? 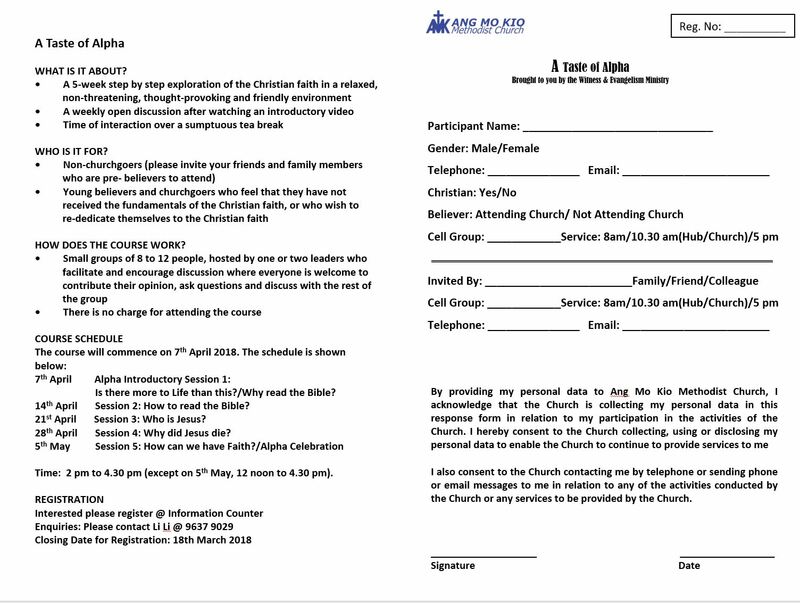 14 Apr Session 2: How to read the Bible? 21 Apr Session 3: Who is Jesus? 28 Apr Session 4: Why did Jesus die? Time: 2.00 pm to 4.30 pm (except on 5 May, 12 noon to 4.30pm). Interested please register @ Information Counter this Sunday.